I’ve had a honey epiphany. As a consumer of our local liquid amber, I’ve seen variations of flavor and color over the seasons and years, but always sweet and delicious. Except, of course, for that memorable year when the town paved the roads and the honey had, let’s call it, um, distinctive asphalt notes. Here’s the amazing discovery. I made a recipe from a friend that required Italian chestnut honey. I was assured that it was integral to the recipe and to forget about local, get on the Internet, and order me some. Fine. It arrived. I opened it. Took a sniff. Bleck. Had it gone bad in transit? I then read the label, which described it as (and I quote) “ideal for who don’t like very sweet flavour honey.” I took a lick. Double bleck! 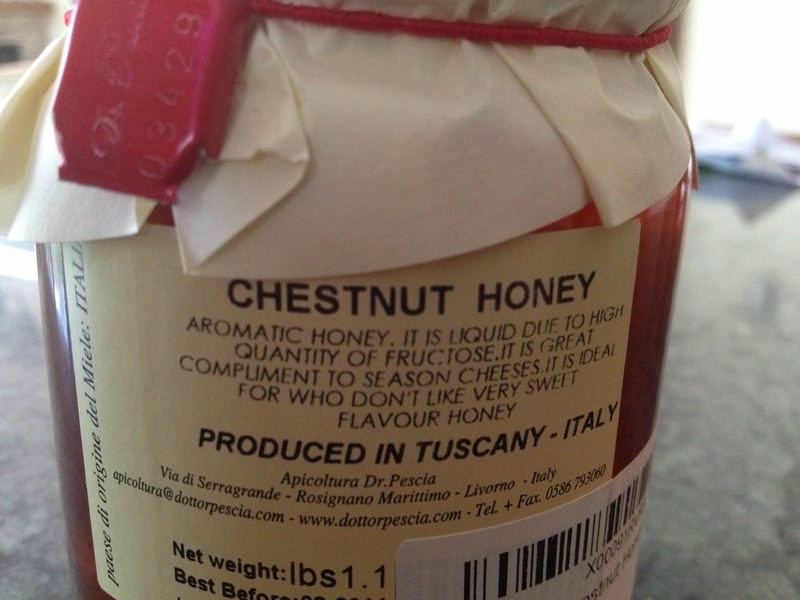 Had I just been poisoned by the infamous Internet Tuscan honey mafia? More reading… The site Serious Eats describes chestnut honey as “not for the timid palate” and “Dark and spicy, with touches of smoke and leather, chestnut honey is complex, mysterious, and nuanced.” Yup, that about sums it up. Leather and smoke. But in defense, it did impart a distinct and magnificent flavour to the recipe. Bottom line… I had no idea that honey could be so variable, which makes me want to embark on my dream beekeeping project even more. But, after the great rooster disaster of 2012, I’m not eager to once again mix toddlers and talons until the kids are much older. Ps. Welcome back! It’s been ages since my last post because our family welcomed a new addition to our ranks. Priorities, now. So as baby sits by me and assists with “yayayayayayaYAyaya” we can now find the time to get back to hobby blogging about our minifarm.